X Cupressocyparis leylandii is an intergeneric cross between Chamaecyparis nootkatensis (Alaskan Cedar) and Cupressus macrocarpa (Monterey Cypress) that was found in England in the 1800’s. The Leyland Cypress is a fast growing tree reaching up to heights of 60-70 feet, usually seen at 40-50 feet tall and widths of 8-15 feet. It produces small cones composed of scales and the leaves are very similar in looks to the Arborvitae tree. Its pyramidal form makes it popular in the Southern Coastal areas as a cut christmas tree. The Leyland Cypress accepts a wide variety of soil and climate conditions even though bagworms may be a problem. 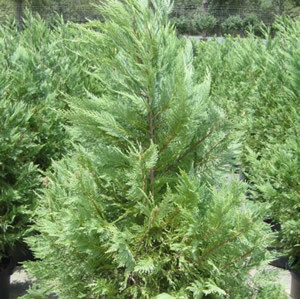 Leyland Cypress grows well in Texas but is best for the Eastern portion of the state.